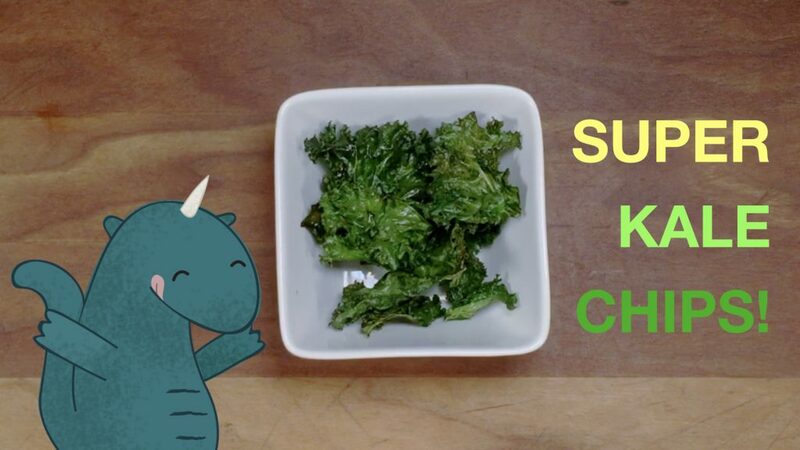 Make SUPER TASTY Kale Chips! This is a an easy recipe to make that’s SUPER TASTY and made with a SUPER FOOD: KALE! Take the ribs out and only use the leaves. Rip the leaves off into big chip-sizes (they’ll shrink when they bake) and put them in a big mixing bowl. Wash and spin/dry kale. Use a paper towel if you need. It’s important that the kale is dry if you want them crispy! Drizzle some olive oil around. Don’t add too much. We want just enough so that it’s lightly coated when you rub it in. You can always add more later if there’s not enough. Lightly salt the kale leaves. Again, you can always add more later! Mix it all together with your hands, so that you rub a little oil and salt in every yummy piece. Try tasting a piece to see if there’s enough salt before you bake it. Spread the kale leaves on the parchment paper on a baking sheet. Make one layer and try to make space for all the leaves so that each piece gets crispy! Bake in the oven for 20-25 minutes or until they’re crispy but still green. EAT DELICIOUS CRISPY KALE CHIPS! WATCH the video and make it with Little Belly Monster! Share a yummy and healthy snack with Little Belly Monster. 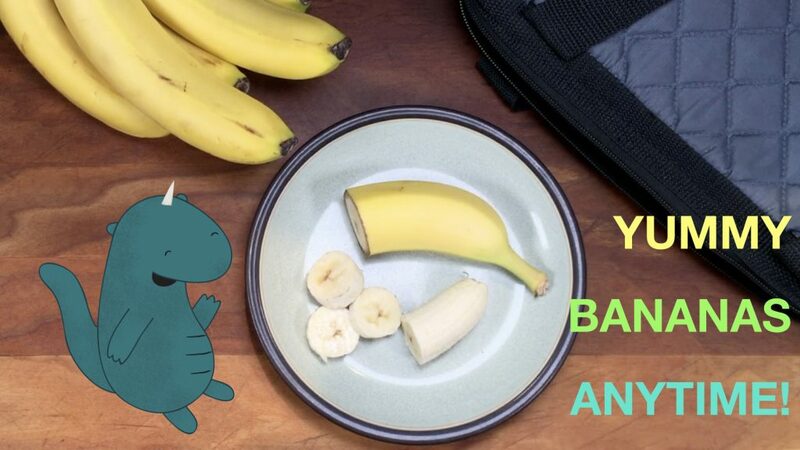 Watch, as Mummo shows him lots of different ways to eat bananas, before he chomps one all up! Perfect on pancakes, in muffins, with snacks or just on their own! And they’re delicious anytime of year. This little monster loves nutritious & delicious food. 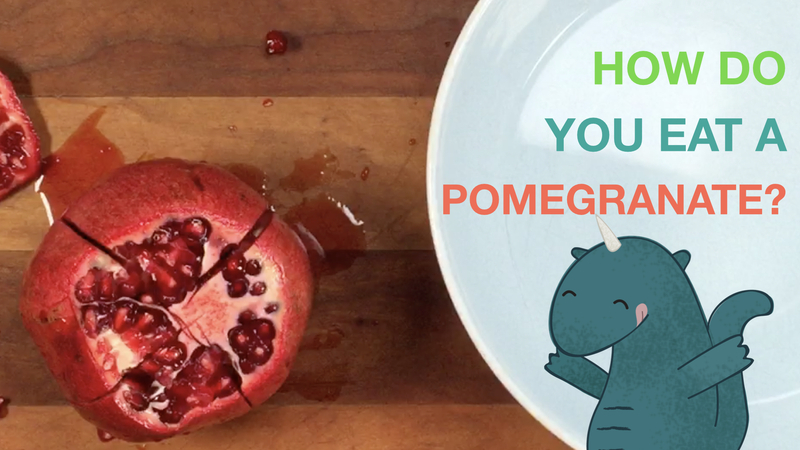 Watch with Little Belly Monster as he learns how to seed a yummy pomegranate & ideas on ways to eat it, before he chomps it all up! Try this Creamy Fruit So Many Tasty Ways! Yummy Elf Snack & Shopping List! Yummy Reindeer Treat & Shopping List! Yummy Yogurt Snowman Snack & Shopping List!